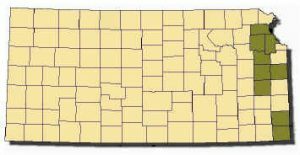 Range: Found only in forested areas of extreme eastern Kansas, from Atchison County in the north to Cherokee County in the south. Description: Harmless. Scales keeled. Body may be gray, brown, reddish brown, brownish yellow or blue-black. Belly generally red, but can be yellow, black, orange or pink. Head darker than body, nape of neck has three light spots, often forming a collar. Young generally look like adults. Habits: Inhabits moist forests, hiding under logs, rocks and leaf litter. 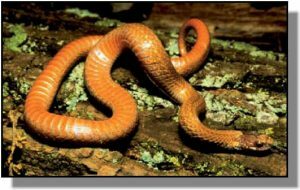 This snake is active from March to October and breeds in spring and fall. An average of 8 young per litter are born in late summer or early autumn. Eats earthworms, slugs, and land snails.